It’s not a how-to book or Baby Einstein – it’s as simple as making an appointment with your massage therapist. Prenatal massage is becoming a favorite of expectant moms everywhere who want a little reprieve from the discomforts of pregnancy. – eat right, exercise, limit caffeine intake, take vitamins, abstain from alcohol, and certain medications – but until recently, get a massage hasn’t typically made the list. New research, including a recent study at the University of Miami Miller School of Medicine, shows that prenatal massage can have multiple positive effects on women who are expecting. As a licensed massage therapist and someone who has received a prenatal massage myself, I recommend pregnancy massages to any expectant mother looking for decreased stress and discomfort during their pregnancy. However, it is important to remember that special precautions should be taken with massage therapy during your pregnancy. Prenatal massage addresses many of the most common discomforts women experience during pregnancy, involving skeletal and circulatory changes caused by hormonal changes. Prenatal massage can treat a number of ailments, including tension headaches, anxiety, back pain, poor circulation, swelling, edema, sleeplessness, and achy joints and muscles. Prenatal massage may even help improve labor outcomes and newborn health. The most common benefit women notice is the reduction of swelling and overall nerve pain. Massage can reduce swelling by stimulating soft tissues to reduce the collection of fluids in swollen joints. Also, massage therapy addresses inflamed nerves by helping to release tension in nearby muscles. Because massage therapy is not recommended during the first trimester, if you continue to get massage therapy during your pregnancy, it’s very important to let your massage therapist know that you’re pregnant. I try to stress to my clients that it’s best to wait until the second trimester to begin prenatal massage sessions. Prenatal massage is modified specifically for pregnant women through different positions. The most common and safest position for prenatal massage is for a woman to lie on her side, propped up by pillows. Of course, there are more precautions and risks from massage when you’re pregnant. Interested in training in prenatal massage? Many of our students in the Massage Therapy program at Dawn Career Institute learn about prenatal massage but are encouraged to take continuing education classes to expand their knowledge on specific topics including prenatal massage. Once students are registered massage therapists, continuing education units (CEUs) are required to maintain a license. CEUs range from prenatal massage to polarity therapy or bamboo fusion. Students can choose to specialize in prenatal massage with their continuing education units. New Beginnings Spa at Dawn Career Institute offers the best in massage, body therapy, facials, or advanced skin care at moderate prices with treatments provided by well-educated, advanced esthetics students supervised by highly qualified instructors from Dawn Career Institute. 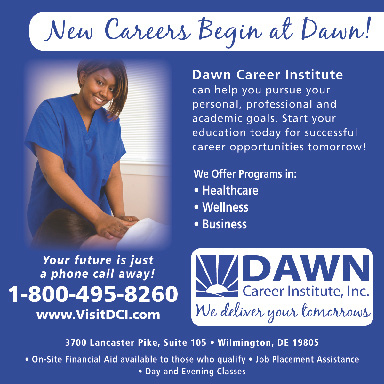 To make an appointment, call New Beginnings Spa at 302-225-6500 or visit www.dawncareerinstitute.edu/spa. The spa is located at 3700 Lancaster Pike, Suite 307, Wilmington, Delaware. * Please note that New Beginnings Spa does not offer prenatal massage services.